Research4Life is central to our goal of achieving universal access to scientific, technical and medical research information. As a unique public-private partnership between UN agencies, universities, and publishers, it reduces the knowledge gap between developing and industrialised countries with free and low-cost access to critical scientific research. 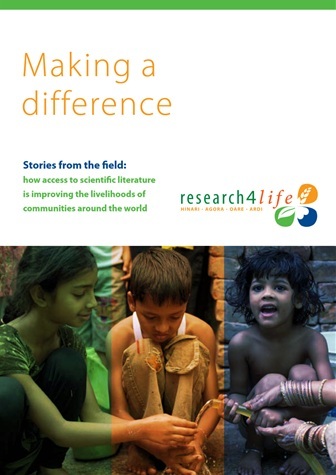 Research4Life has four main programs – HINARI, AGORA, OARE, ARDI – that provide research for free or at low cost to institutions in the developing world. Our goal is to foster a strong and independent research culture in the developing world – one that is fully integrated into the international research community with sustainable economic development and enhanced quality of life. As a founding partner, Elsevier contributes over a quarter of the nearly 68,000 peer-reviewed resources in Research4Life, encompassing ScienceDirect and Scopus, including over 3,100 Elsevier journals and 13,000 books. In 2015, there were over 5 million Research4Life article downloads from Elsevier’s ScienceDirect. We also provide technical and communications expertise to advance Research4Life, and have committed to the program through 2020. Elsevier also leads a communications task force of publishers and partners to boost the visibility of Research4Life. Projects have included a formal re-branding, films, bylined articles, panel discussions at science conferences, press releases, a website launch and research output press briefings. In addition to communications, colleagues throughout Elsevier are involved in Research4Life task forces on access, authentication, metrics and training. In this new video, we follow Nasra Gathoni for a day in her job as librarian at the Aga Kahn University library. Nasra talks about her experience, explaining to us how she is helping doctors to find the right scientific information through the Research4Life programmes. 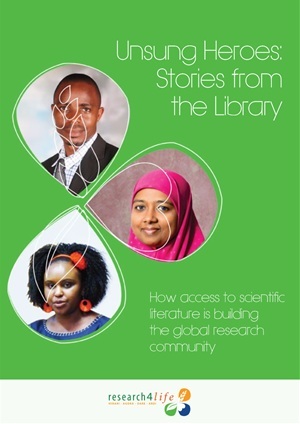 Dr Sami Hyacinthe Kambire, a researcher from Burkina Faso, shares how Research4Life has helped him to develop better and more informed scientific writing skills, produce focused research, compete more effectively for research funding and deliver better teaching programmes. Tiny Tim & Friends is a Zambian organisation specialised in paediatric HIV/AIDS clinical care. Research4Life sources provide information for the development of policies and medical procedures and enable the charity to obtain essential information about groups performing related research. Through grants from the Elsevier Foundation, MLA's Librarians Without Borders (LWB) programme has been able to provide a series of research capacity building "Train the Trainer" workshops and distance learning curricula across the developing world. LWB coordinator, Lenny Rhine, University of Florida Librarian Emeritus works closely with the WHO and ITOCA to ensure maximum training reach and synergies. Distance and on-site training have proven to be the most effective way of increasing usage of the scholarly publications available through Research4Life task forces. Researchers should thank librarians who help to find their bibliographies. The work they perform is science without acknowledgement. - Dr. Sami Kambire, Burkina Faso. Just as I can’t stop eating breakfast before going to work I will not stop looking for clinical evidence on HINARI. - Mulugeta Bayisa, Ethiopia.